Shampooing seems like such a simple thing. It’s just washing hair right? So why does it confound us so much? I am going to lay out the dos and don’ts of hair washing. This is so variable. It all comes down to hair type and lifestyle. If you’re working out hard everyday and sweating a ton, I’d say you need to wash your hair more often. If you have curly hair, I would say wash your hair less often. Moisture being the main thing here. The more you wash, the more natural moisture you won’t be able to accumulate. If your hair turns into a grease-pit the very next day, you may be using the wrong products. In the time I’ve been doing hair, I’d say very few people actually have an oily scalp problem and it’s more of a horrible product problem. As a rule, I tell my clients to wash their scalp and condition their ends. Start at your scalp with the shampoo, make sure you emulsify completely in your hands before you start massaging. This will help disperse the shampoo easily. Massage with your finger tips and try to be gentle. The more rough you are at this point, the harder your hair will be to manage. 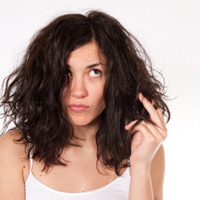 Being rough during shampooing will rough up the cuticle layer and make hair frizzy and unmanageable. So gentle massaging and take the suds to the ends of the hair and gently wash. You don’t need to waste product on the ends. They just don’t need to be cleansed the way your scalp does. Rinse. Now when you apply conditioner, apply it to the ends of your hair and work through. For some clients, I tell them they don’t really need to bother conditioning the scalp. Unless your scalp is extremely dry, your natural moisture and oils will do the work. But if you feel incomplete, take what is left on your hands and bring it to your scalp. Rinse. When should you deep condition? Only very damaged and dry hair needs to be on a deep treatment regimen. If you fall into that category, and let your stylist guide you, then use a nourishing and strengthening deep treatment. Your stylist will probably be banging your door down with a treatment if your hair falls into this category. I have clients who tell me they really need a deep treatment and their hair is so damaged, but the perception is different. By damaged hair, I mean it’s brittle, and the ends disintegrate at a touch. Generally a deep treatment every 3-4 shampoos is a good idea, but not necessary for healthy hair. I always recommend a leave in treatment for my clients. It’s the best thing you can do for your hair, no matter the type. There are plenty out there but I really love Aquage Moisture Mist, Pureology Color Fanatic, Redken Antisnap, and Moroccan Oil Treatment. Use it after every shampoo and you’ll be maintaining your hair and keeping it healthy. If you get your hair color treated, then absolutely you need a leave in. Not only will it keep hair from getting dry, but it will help your color stay fresh. The whole “no poo” movement has left the country divided. Here’s where I stand on it. Ok if you have curly hair, absolutely not if you have fine or limp hair. If you don’t know what this is all about, it’s basically using a conditioner to clean in between full on shampoos. Pureology makes some good cleansing conditioners. These no poo varieties can build up on hair if you over do it and I honestly think it’s best for very curly hair. The kind that you don’t blow out but leave curly. I have curly/wavy/frizzy hair naturally. I have yet to love the no poo thing because it builds up on my hair type and makes my scalp uncomfortable. To sum it up, if it works for you, do it. But if your stylist is griping about build up or your hair always feels dirty even after a shampoo…rethink. And please stay away from Wen. I have seen and read about some truly horrible results. Protein? Moisture? What does my hair need? So the best I can do with this is ‘go ask your stylist’. I really wish there was an easy answer for this, but it really varies. I have to touch and feel and even smell my clients’ hair to assess what they need. Just so you understand the thought process, hair needs a balance of protein and moisture. Your stylist would factor in environment, lifestyle, your actual hair type, and what treatments you do regularly to your hair. I’m in Houston, so during summer I have to switch all my clients to a different product pairing because the moisture in the air really makes a difference. This applies to drier climates as well. The lack of moisture in the air can contribute to dry brittle hair. The pH of your hair and the water you use to wash your hair makes a difference too. If I have clients who have really hard water or constantly complain that their highlights “went brassy”, there is a set of products for that. So long story short, ask your stylist. But understand that it isn’t as simple as ‘my hair feels oily, I need something for oily hair’. You may end up exacerbating the problem because you’ll dry your scalp out and have it creating even more oil to compensate, when the problem was actually you needed a moisturizing shampoo/conditioner. Is salon product really all it’s cracked up to be? In short. Yes. Absolutely. I’m saying this from experience. Not because I’m a salon snob. Truly, if Pantene and Dove were really that amazing, we’d be using it in the salon. Promise. I can feel the drug store stuff in my clients’ hair before they tell me they’re using it. I can smell it. I can tell when colors don’t process properly, that there is something gross coating the hair. If drug store stuff is all you can afford, fine, but let me tell you…it all works out the same. Salon product is concentrated and works. This means you use less each time. You get the same size bottle but you use less product. Drug store product has cheaper fillers that build up on the hair. So maybe the first time you use it, it’s lovely, but then over time you’ll notice your hair taking longer to dry or it still feels dirty and greasy. That’s build up. Your stylist will be able to scrape it off with her shear or razor. I always do that to show my clients the disgusting film that’s standing between them and that amazing hair they keep praying for. I’m not trying to shame the people who use drug store product or can’t afford salon product. There are affordable salon brands like Redken. What I’m saying is, the solution is there. If you’ve been having issues, switch your product. From personal experience, I had to use Dove when I forgot my stuff and my hair immediately was dull and limp and felt greasy. Same thing with Garnier, Herbal Essence, Tresseme, Vidal Sassoon. I mean, it was instant and so gross. So if you have the means, get the salon product. And from a salon please. The stuff you find discounted at Amazon, Target or Walmart is unethical and not guaranteed. If your hair falls out from using that, there is no one you’ll be able to sue or blame. Leave questions below. Please be kind. If you don’t agree, that’s fine. But you’re wasting your time leaving an ugly comment. So you told your stylist you want to grow your hair out. And they told you to get a trim every 6-8 weeks?! Are they bonkers? Trims keep the ends of your hair healthy. Once the ends start to split and fray it’s dunzo. Nothing will permanently fix split ends. There are short term remedies like Brazilian Blowout Split End Remedy or products from Pureology and Redken that help treat splits. However to truly “fix” split ends you need to cut those bad boys off. What happens if you don’t get that regular trim? Basically your ends will be disintegrating at the same rate that your hair is growing and it will seem like your hair stops growing at a certain length. Or your hair ends up really wispy on the ends. Reminiscent of rat tails. I tell my clients to trim hair every 6-8 weeks if they want to grow or if they have long hair. Short hair clients I ask to come back 3-6 weeks. This is about the time it takes for a short haircut to lose it’s shape. Hair grows at different rates so a haircut will eventually lose it’s shape. On average, hair grows about 1/2 inch per month, give or take some depending on health. So if you’re wanting to grow your hair, get regular trims and use good products to promote scalp and hair health.